There is no doubt that Facebook is one of the most popular Social media site. Most of the Facebook users login their account daily to connect with their friend and Family members. From last few Year, Facebook is rolling out some new features to add more security and privacy to its users. With the helps of these security features Facebook user will secure their account from hacking. The hacking of Facebook profile accounts has been a constant occurrence for several years now. If you are the Facebook user and want to tighten up the security of your Facebook account and keep hackers off from your Facebook Account. In this article, we will go through some important tips which you will apply on your Facebook account and make your Facebook account strong and avoid Facebook scams. 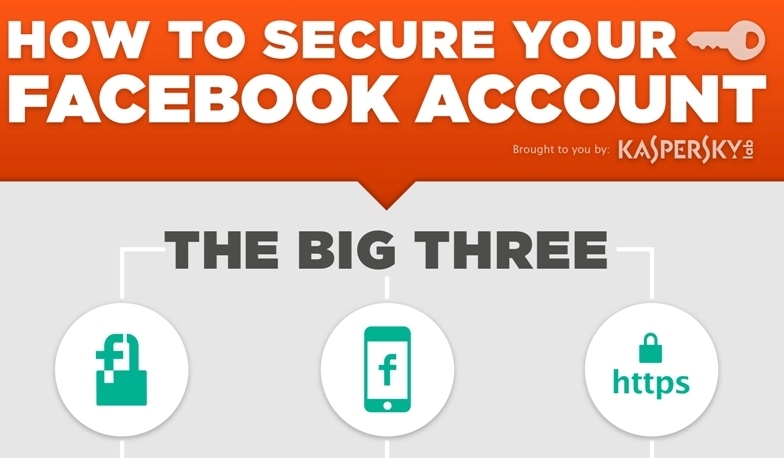 Thanks to Kaspersky, Who released a Facebook Security Infographic, which users can easily use on their account. Kaspersky is one of the most Popular Antivirus company and one of the most trusted anti-virus tool for the Windows users. There are so many ways which helps you to secure your Facebook account from being hacked and ways which helps you to recover a hacked Facebook Account and Steps to Check Your Facebook Account is Hacked or Not. Yes, though Facebook is the most popular social network on planet, however the Facebook have lack of security which cause user profile hacking and data staling.